Soft white flesh and milk are found inside the nut enclosed in a brown fibrous husk around a brown shell. When ripe, the nut has a hollow centre and the flesh hardens onto the shell. 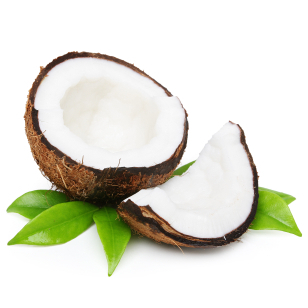 Fresh grated coconut can be added to curries and fish dishes and desserts. Coconut milk can be added to sauces, cocktails, drinks, rice and puddings. TROPICAL MELON SALAD:- Dice or ball 1/2 rockmelon, 1/2 honeydew melon,1/4 watermelon and grated flesh of 1/2 coconut. Add 1 cup of sour cream.